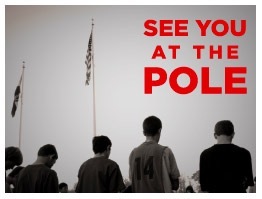 Today is “See You At The Pole” day. My daughter is in her final year of public high school. Prior to open-enrolling in an inner city school, she attended a private Christian school as well as a Christian daycare near our home. We taught our faith at home but also wanted the same principles throughout her day. There are a few options for educating our children– homeschool, public school, boarding school, specialty schools, community schools, and various private education options as well. It is my opinion that they are all beneficial to our children depending on their individual needs. There may be options needed within a family unit, necessitating multiple school options in the same household. There may also be years that a child will benefit more with an alternate educational experience. I can think of many friends who have exercised their freedom throughout their children’s education. Our decision to transfer our daughter into a specialized public high school was not met with agreement by many who questioned our quick decision just before the start of her freshman year. It was the right choice for her as we feel her elementary and junior high experience was a good fit. There is no perfect pattern for parenting. No perfect formula for keeping life in balance. We all must do our best to parent with the knowledge we have. My daughter attends public school and prays at school. No, the prayers aren’t led by the teacher or administrators. They are generated from her heart, where they should originate. She prays out of reverant obedience to her Creator, not out of parental obligation. She can pray before she eats lunch, before she takes a test, when she’s having a challenging day. Anytime. Anywhere. She has attended Bible study over her lunch hour. They are free to assemble and talk about their common beliefs. She has sought the counsel of teachers who, knowing they share the same faith, have provided wisdom to help her cope with challenges in and outside of school. My point is this– prayer can be a part of your students day but they need to have this example at home. Just as they need our support for their educational studies, we cannot send them to school and hope they catch faith. Even sending children to a private school requires the same parental support. This is a brief post. I don’t mean to offend– I’m just offering my opinion as a parent who has been on both sides of the fence. Kids are salt and light in the world at a very young age. I’ll talk more I this in a future post.